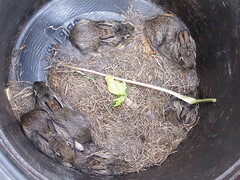 A mother rabbit left her babies in the yard on Wednesday or Thursday night. Apparently there were about seven of them, but they scattered as Jonna and the kids went out to do yard work this morning. I, of course, made them take pictures of the rabbits they were able to round up before they set them free in out in the brush in the back yard (per the advice of Animal Control). Now, enough of that. We’re off to Revenge of the Sith. This entry was posted in General by Ron Bieber. Bookmark the permalink.